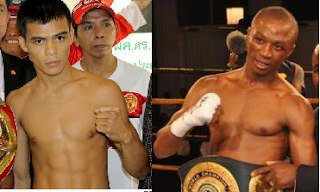 Filipino Ryan Rey Ponteras is scheduled to face the International Boxing Organization World super flyweight champion Gideon Buthelezi on July 28th at International Convention Centre, East London, Eastern Cape, South Africa. Ryan Rey Ponteras is a 27 years old boxer from Panabo City, Davao del Norte, Philippines. He has a record consisting of 20W(9KO)-11L-1D. The Filipino fighter is the current Philippines Games & Amusement Board (GAB) flyweight champion and now gunning for the IBO title. Ponteras won his last 7 fights mostly by decisions. On the other hand, Gideon Buthelezi is the current International Boxing Organization World super flyweight champion and this will be the first defense of his title. He won his title in his last fight against Angel Aviles of Mexico via unanimous decision. Gideon Buthelezi has a record of 19W(4KO) with 4 defeats and currently, world rated no. 11th in the super flyweight division.